The trail to Vandal Savage leads behind the Iron Curtain in 1986. 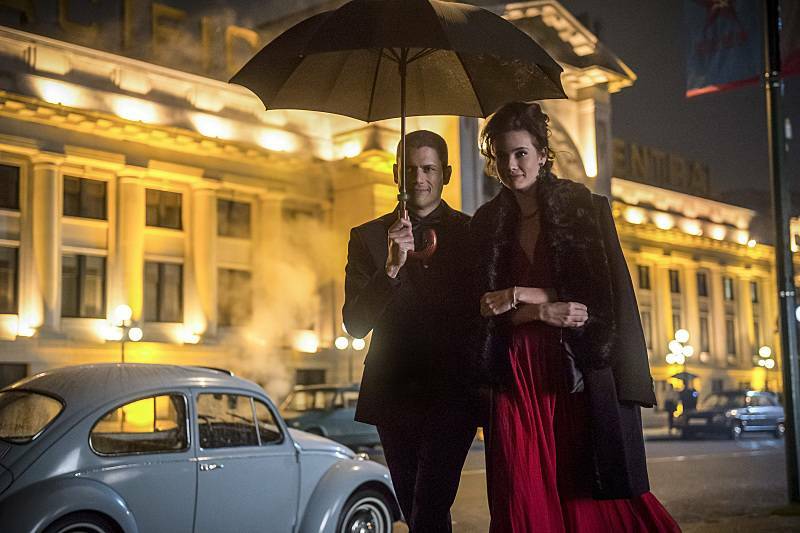 Rip tasks Ray Palmer with establishing friendly relations with a Soviet scientist in order to learn what Savage is up to, but it is Leonard Snart who takes charge after Palmer leaves her cold. At the same time, Sara begins to train Kendra in controlling her anger in combat, an argument between Jax and Professor Stein threatens the Firestorm union and Rip Hunter considers an offer of clemency from his favorite teacher. Ignoring that it would defeat the point of the whole heist sequence and giving the whole team something to do, Ray does have a point about it being much easier for him to just shrink down and break into The Pentagon. How did Firestorm get into the Pentagon unnoticed? It doesn't seem like he has the phasing powers the character has in the comics. Again, the banter between Brandon Routh and Wentworth Miller is the comedic high-point of the episode. The two have wonderful comedic timing and play off of each other perfectly. The interplay between Caity Lotz and Ciara Renee is quite good. Nice to see the show's only two female leads finally getting a chance to interact. Dominic Purcell has mostly been used as comic relief thus far. But this episode does give him a chance at showcasing a slightly deeper side to Mick Rory. At the very least, his conversation with Rip shows that he is more than dumb muscle. The heist sequence at The Pentagon is very well directed. Ray Palmer says at one point that he always wanted to be a spy. Brandon Routh actually did play a spy on the TV series Chuck. Rip sarcastically refers to Kendra as "The Winged Avenger." This was the nickname for both Hawkman and Hawkwoman, in much the same way that Green Arrow is "The Emerald Archer" or The Flash is "The Scarlet Speedster". Valentina Vostok first appeared in Showcase #94. A member of the Soviet Air Force in 1977, she stole an experimental plane in order to defect to the USA. Unfortunately, the plane malfunctioned and she crash-landed on the same site where the original Doom Patrol had died. Her body absorbed the energy being that had once lived inside the body of the hero Negative Man and she gained the power to turn herself into a being made of pure energy. She fought crime with the Doom Patrol as Negative Woman for a time, until she lost her powers. She went on to take a job with the US Secret Service and eventually became a part of the spy organization Checkmate. Reference is made to a place called The Vanishing Point. In the comics, The Vanishing Point was the home base of The Time Masters, located one millisecond before the end of the universe. A telefax - or tele-facsimile - is a high-tech (by mid-1980s standards) method of sending information through phone lines. Ray describes it as an e-mail on paper. Jefferson accidentally causes an alarm to go off after ignoring an electromagnetic pulse and touching a neutral wire, causing power to pass directly through him. Stein is about to explain the basics of alternating current power before being cut off by the alarm. Gideon is capable of generating low-end EMP capable of wiping all of The Pentagon's magnetic media, including security footage. Rip has a set of ingestible translators, wihich attack to the larynx via neural interface. Anyone who swallows one can, with the assistance of Gideon, speak and understand any language. Incorrectly shutting down the core of a nuclear thermal core can result in strangeness, black holes and uncontrolled fusion reactions capable of destroying the universe. Ray Palmer: (sarcastically) Because this is so much easier than just shrinking down and stealing it. Ray Palmer: That's a nifty little trick. Ray Palmer: Really? We're trying to save the world and you're lifting wallets? Len Snart: It's called multitasking. Ray Palmer: Wow, it's a MiG-21. No one's ever been this close to one before. Len Snart: ... are you quoting Top Gun? Professor Stein: (entering the bridge, following the crash) If it were up to me, they would revoke your pilot's license! Rip Hunter: "They" are more than welcome to, considering I don't have one. Rip Hunter: Dr. Palmer, you will engage Vostok at the ballet, whilst you, Mr. Snart... you're going to be his wingman. Ray Palmer: Better go bone up on Vostok's CV. Len Snart: I guess I'll bone up on the ballet. (looking at the computer) Gideon? Bone me. Len Snart: Damn. That was cold, even by Russian standards. Kendra Saunders: Two months ago, I was a barista. I had no idea I had some psycho hawk goddess inside of me. And then I meet Carter and he convinces me to let her out... and now that he's gone... I can't control it. So thanks for the offer, but I won't risk letting that monster out again. Sara Lance: That monster inside you is not gonna go away. You have to learn how to control her. Kendra Saunders: And how, exactly, do you expect me to do that? Sara Lance: (tossing Kendra a staff) Let's find out. Rip Hunter: Mr. Rory? How would you like to accompany me on a little mission? Mick Rory: Will I get to use my gun? Rip Hunter: A near-certain likelihood. Mick Rory: Lead the way, Captain. Len Snart: Sorry, is this man bothering you? Valentina Vostok: Do not trouble yourself. I am not a damsel in distress. Len Snart: Good, because I'm not a white knight. Len Snart: You enjoy the show, Raymond? Ray Palmer: I think I've got frostbite in some not-so-fun places from waiting out here. Did she tell you what kind of weapon Savage is building? Len Snart: Didn't come up. Such a romantic evening, I didn't want to spoil the mood. Ray Palmer: So other a steamy good night kiss and a possible case of hypothermia, we've got nothing! Len Snart: I wouldn't say that. (holding up a piece of plastic) It's Valentina's security badge for a place called Luskavic Labs. Whatever weapon she's building for Savage, we'll find it there. Ray Palmer: I guess I should just be happy you didn't swipe her wallet. Druce: I'm so sorry it had to turn out this way, but The Council cannot risk keeping you alive. Rip Hunter: Such a shame. I won't be able to tell Mick he was right. Rip Hunter: My colorful friend? Who was convinced you were planning on killing me. Druce: Your friends seem to have abandoned you. But no matter. Chronos will track them down. Rip Hunter: Can't believe you brought this stooge to do your dirty work. I never had you pegged as a coward, Druce. Druce: In that case, I promise to stay here to ensure that your punishment is carried out properly. I wouldn't want you to die alone. Rip Hunter: Who says I'm alone? Mick Rory: Ah, the med-bay! Where a morphine drip awaits me! Professor Stein: We've all made sacrifices. But can't you see that this mission, stopping Savage, is bigger than any one of us? Jefferson Jackson: I am so sick of you using that tone. When are you gonna learn you are not my father? Professor Stein: I'm sorry you lost him at such a tender age, but if your father were here, right now, he'd be saying what I'm saying. Just grow up, Jefferson! The future of the world is at stake, and if you insist on getting yourself killed, as terrible as that might be for your mother, or me, who, incidentally, would also die, I am more concerned with the billions of people who will die because of your... arrogant adolescent ego! Professor Stein: Please don't... don't... Don't say it. I was cruel and unjustified, and I... I said those things just for the sake of hurting him. Ray Palmer: Why aren't you telling that to Jax? Professor Stein: I had to hurt him, Raymond it's the only way I can get through to him. I've tried everything else. Ray Palmer: Well, he's just a kid. Professor Stein: So was Ronald, and look what happened to him. Ray Palmer: Your former half of Firestorm. Professor Stein: Yes. I can't... I... I can't go through this again. I can't lose another. The reason I'm constantly lecturing Jefferson is because I'm the one who brought him along, and if something happens, I'm the one who has to go back to 2016 and tell his mother that her little boy is never coming home. And I would rather die than do that. Kendra Saunders: Let's go. "A warrior trains every day," remember? Sara Lance: I'm not a warrior, and I tried to kill you the last time we did this, remember? Kendra Saunders: "Tried" being the operative word. Look, you want to know my theory? Kendra Saunders: I think your problem is the opposite of mine. I need to learn to embrace my inner hawk goddess, but you... you need to learn to embrace your human side. Sara Lance: And what if that side of me is gone? What if she doesn't exist anymore? Kendra Saunders: Well, only one way to find out. Sara Lance: What, are you baiting me? Kendra Saunders: No. I'm training you. Rip Hunter: Ugh, thank God you managed to grab it. Len Snart: Because of you. Rip Hunter: Only if I'd have sent the other half in to save them, they'd be captured too, and where would we be, hmm? Savage would have both halves of Firestorm, a dead Kendra on top of a dead Carter, everything he wants. It would be the end to our little crusade, and, most likely, the world. So before you pull that trigger, ask yourself what would you have done? Len Snart: That is a pretty cold calculation, Rip. Almost criminal. Len Snart: Except we criminals have a code "You never leave one of your own behind." Kendra's eyes glow red when she goes berserk. Druce was one of Rip Hunter's teachers in The Time Masters. He said Rip was one of his best students and his personal favorite. Jefferson's mother is a widow. He lost his father at a young age. Professor Stein is immune to the effects of radiation but still quite vulnerable to bullets. Ray Palmer was an Eagle Scout. Ignoring the problematic implications of two strong women warriors needing to control their respective rages, it does seem a bit off that Rip Hunter is mansplaining how to handle things to Sara and Kendra. Great dialogue. Great performances. And a great cliffhanger.